No, not the Philosophy 3-1 [which incidentally is scrumptious smelling – *hint hint*] but the edible version – or what should have been the edible version! I’m no chef or baker extraordinaire by any stretch of the imagination so when a gingerbread cookie kit fell into my hands last night – with the cookie cutter included – I was upbeat and optimistic – too much so apparently. Now I have thirty some sad, hard little men – and women – the dough did a bit of spreading to form skirts – or kilts, perhaps – for much of the batch! This has me thinking that perhaps they could be shellacked and strung to become ornaments for the tree. Or stamps. Or fodder for the trashcan. It’s a hung jury. 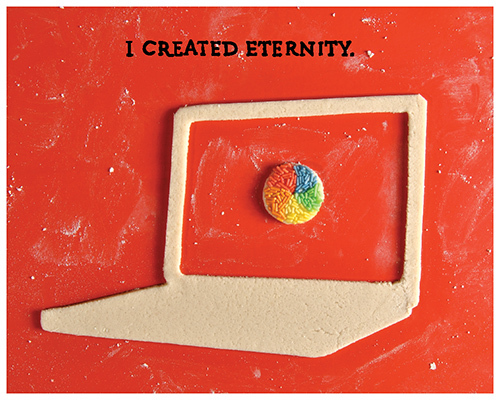 In light of my kitchen mishap, this NYT blog post made me smile today – I especially love the “I created eternity” featuring none other than the Apple swirling thinking icon. Oh how I loathe that symbol! And the “pride” and “envy” pictogram is fantastic too – those boots look just like a pair I own! Seriously. This fanciful distraction from my baking blunder gives me the confidence to face those rejected gingerbread cookies. Or maybe I’ll just slip on those candy colored boots and frolic in the first snow South Jersey has seen this winter! Hurray! 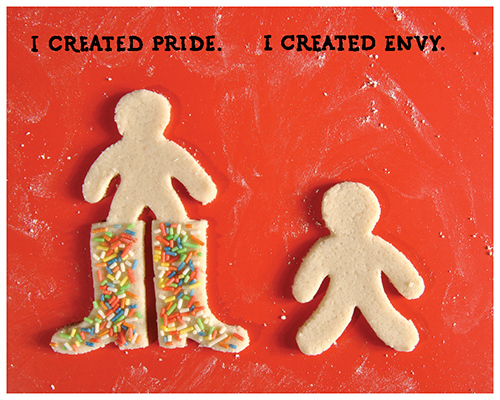 Ha, I love the pride/envy/eternity gingerbread!! I so thought you had made them until you cited the blog… but I was momentarily very impressed! Where are photos of these kilted gingerbread men you made?? !